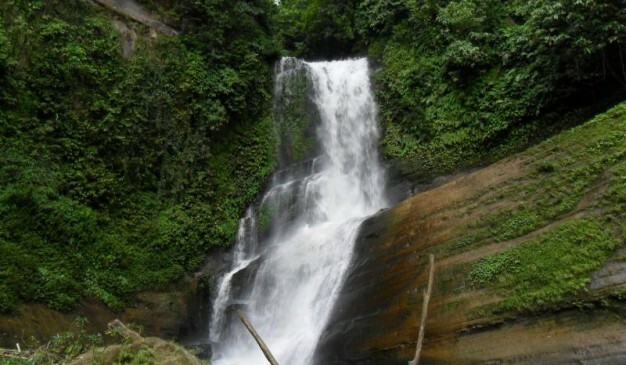 Sijuk Waterfall 1 is located in Rangamati District, but if you decide to have a trip to Sijuk Waterfall (সিজুক ঝরনা), you can form a group comprises couple of ebullient members from Khagrachhari. You may expect poor road condition and other hectic factors. If you start your journey after a quick breakfast from Khagrachhari town, you can start for Dighinala (দীঘিনালা) by using CNG auto rickshaw. It actually costs 500 taka, but you can bargain to manage at best 450 taka. It would be advisable to contact a tour guide for directions. During the journey, you can enjoy the exquisite beauty beside the road from the vehicle. If you start your journey at 8:00 am, then you can expect to reach Dighinala at 10:00 am morning. We can reach Nondoram (নন্দরাম) village by 11:00 at morning through bike. The village is beside the river Kasalong (কাসালং). This village is actually located at the Sajek union of Rangamati (সাজেক, রাঙামাটি). Before this village, an Army camp is located on the way. Travelers must entry their names to that camp. You can have tea in that village and then start your trekking again through the hillocks of Rangamati. 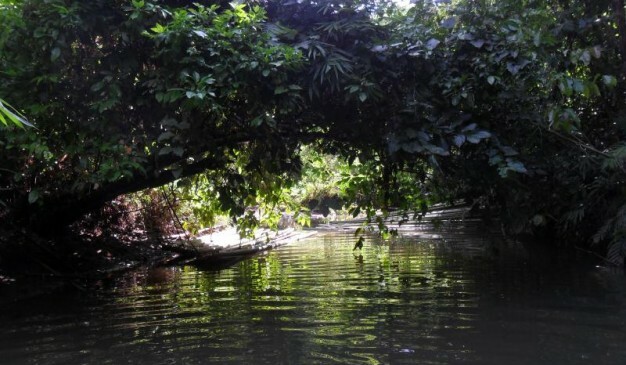 Some tribal people pronounce Sijuk canal as Shishuk khal (শিশুক খাল). The canal is formed after joining two mighty streams. The two waterfalls are located at those two streams. You can explore the left side stream first (furthest) and the right side (nearest) stream later. The level of the water depends on the season, but you can expect to face around an average height of 3-4 ft. But at some points the water level is near 6 ft. Also the canal is totally covered with dark forest. As the depth of the water is very high, the flow of the water is less. Lot of rotten leafs are available on the water. At some places, the mud under the water produce gasses with bad odors with bubbles when pressed by feet. The more you progress, the more you welcome the Hati Poka (হাতি পোকা).Those microscopic insect bite can cause lots of pain. Wasps and scary looking mosquitoes are there too. To add these misery, you may find some leafs stinging. A soft brushing those leafs with arms cause you inflammation. After passing through such hideous, you may finally reach near to the waterfall. We can hear the roaring sound of the waterfall but may not see that. That portion of the Jhiri (ঝিরি) is covered with large rocks. All of the rocks are covered with mosses and ferns. Those are the best hideout for snakes and other reptiles. Also crossing those stones are not easy. After jumping and bumping through rocks, you can finally reach in front of the Sijuk waterfall. It is having mighty water flow. Shorter and mightier than other one. In short, first go to Dighinala of Khagrachhari (দীঘিনালা, খাগড়াছড়ি). From there, hire bikes to reach at Nondoram (নন্দরাম) village. Each bike will cost 700-800 taka for whole day. From Nondoram (নন্দরাম) village, hire any local people to show you the path. They may cost you around 200 taka. If they do not know about the Sijuk Jhorna (সিজুক ঝরনা), just tell them about the Sijuk Khal (সিজুক খাল/সিজুক ছড়া), and the waterfall on that khal (খাল). Also, if you can find the Moni Chakma (মনি চাকমা) from the Dighinala (দীঘিনালা). In that case, you’ll not require any guides. He knows the Sijuk waterfalls (সিজুক ঝরনা) pretty well. You can use his bike to ride, and use him as guide as compliment. Bus starts at 9:30 am. Bus starts at 8am and 10.15 am. Some of the hotels/motels in Rangamati are listed below for your assistance. You need to carry food and drinking water with you. Also, you can stop an Nondoram village and take food from there. This Sijuk Jhorna (সিজুক ঝরনা) is located at Rangamati (রাঙামাটি) district. But for easier access you have to use Dighinala of Khagrachhari (দীঘিনালা, খাগড়াছড়ি). 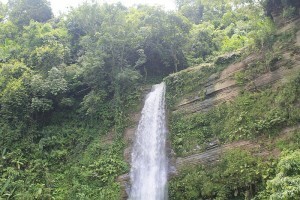 Patang Jhiri Waterfall is located at Ruma Upazila in Bandarban. 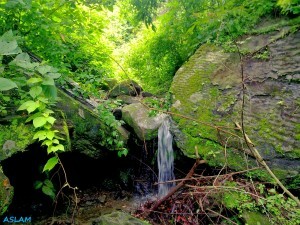 Patang Jhiri waterfall is also near to Boga Lake. Patang Jhiri is situated before the way of Boga Lake. 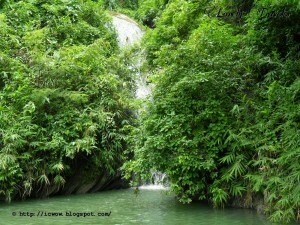 When a traveler travels to Boga Lake he should visit Patang Jhiri waterfall. In rainy season it is very difficult to reach at the top of the waterfall but in winter some undaunted traveler climb at the top of the Patang Jhiri Waterfall. Patang Jhiri is not very big waterfall but its structure and surrounding view is really exceptional. If you are a trekker from Bangladesh, then you are already familiar with the "Jiri Path". Its a walking path where you have to walk through the water streams which are coming from the top of the hill. The water level is very low here. Most of the cases an average of 1 feet or less. But some places from the "Jhiri" are having very deep water level. There are several areas under the waterfall where the water gathers, and made those a natural bathtub. The main one, where the water dropping directly, having no depth found so far. Many people tried, but couldn't find the depth. The teal colored crystal water from the basin is really something. It will be hard for you to leave the place. 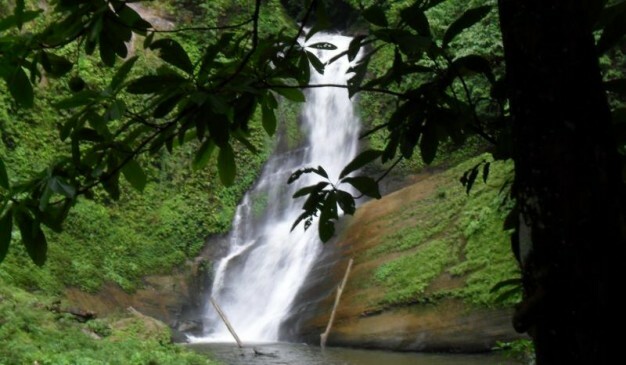 Madhabkunda Waterfall and Eco Park is situated in Barlekha Upazila in Moulvibazar District of Sylhet Division. It is one of the largest waterfalls in Bangladesh. 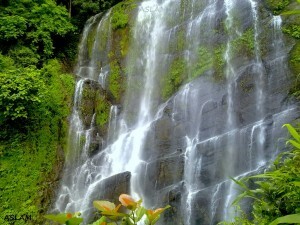 The waterfall is a popular tourist spot in Bangladesh. Big boulders, surrounding forest, and the adjoining streams attract many tourists for picnic parties and day trips. The 267 hectors Madhabkunda Eco Park (est. 2001) is located at Madhabkunda under Moulvibazar District. 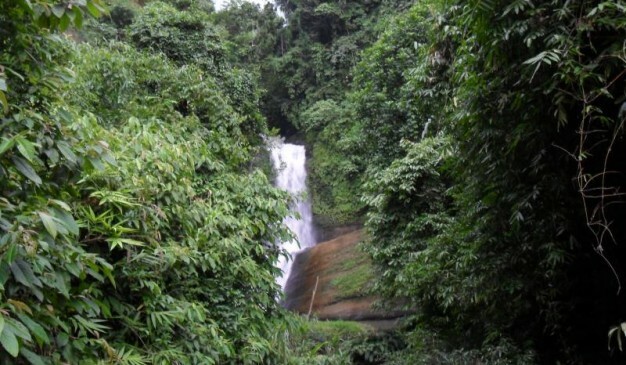 This area was declared as Eco Park with a view to conserve the Madhabkunda waterfall and surrounding biodiversity. 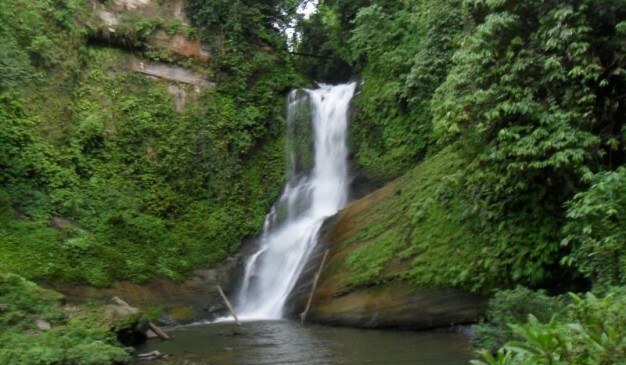 The Madhabkunda Waterfall is the most attractive site of this Eco Park which is about 200 ft. (61 m) high. A section of ‘Khasia’ tribe lives in the forest villages of this area. 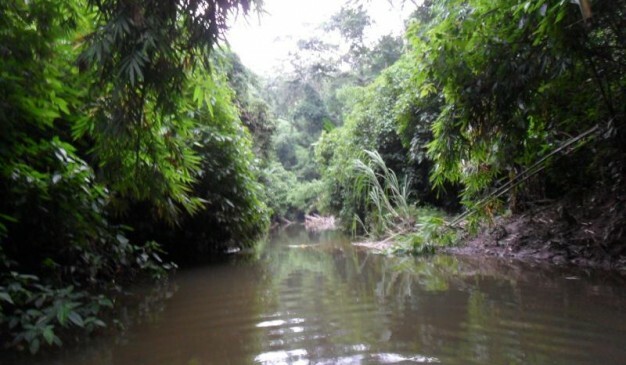 They are engaged in some agro-economic activities in the forestland. 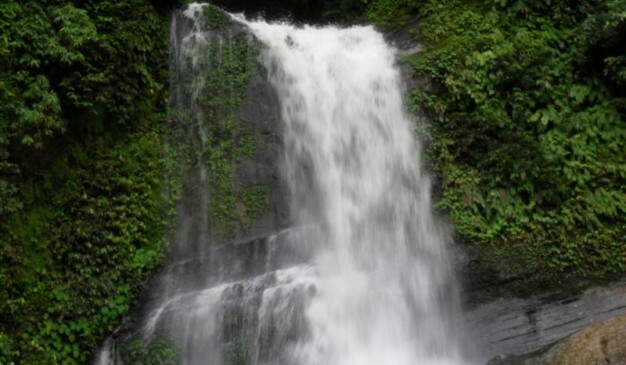 This waterfall is known as Horinmara Kundo Waterfall (হরিনমারা কুন্ড ঝরনা). The waterfall has a beautiful basin underneath with pristine green water that was slightly colder. The waterfall was dropping directly on that basin. And it doesn't have any space at the front side (blocked by a small mound). That's why it is not possible to get a full view of the waterfall from the front (or any places). Once upon a time, this area was having a lot of wild deers. However, by the grace of our greedy human nature, they have almost been vanished. During that golden era, lot of deers used to come here near the basin to drink water. This basin was always filled with water regardless the season. And the deers used to slack their thirst from here. And we shameless human used to hunt them from here. That's why the name of the waterfall is Horinmara Kundo Waterfall (হরিনমারা কুন্ড ঝরনা) or Horinkundo Waterfall (হরিনকুন্ড ঝরনা). 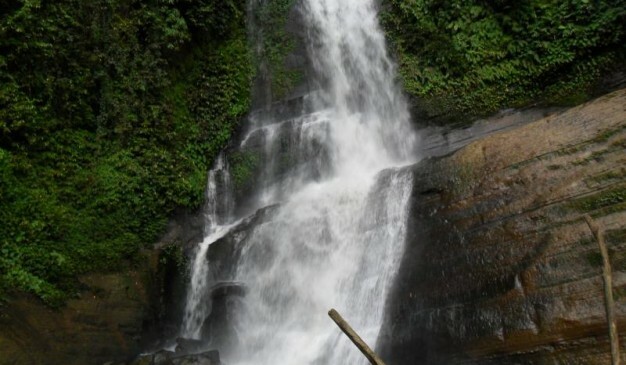 Jadipai Waterfall also known Jadipai Jhorna is one of the widest waterfalls in Bangladesh. Jadipai Waterfall is really nice place to visit. During the rainy season the flow of Jadipai fall becomes powerful. The water of this fall is cool and transparent. Though the path of this area is not smooth but when you reach there you will feel the tranquility one desires. 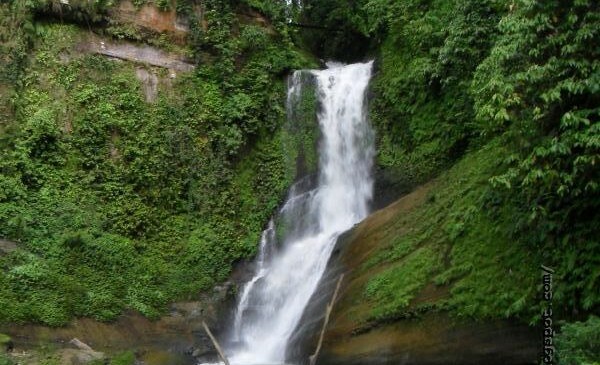 Jadipai Waterfall is located at deep inside the hilly area of Bandarban. 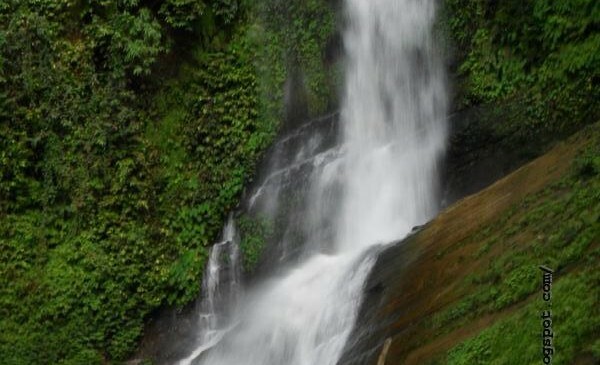 It is the most charming waterfall of Bangladesh. If you want to see the natural beauty of Bangladesh then must visit Jadipai. This waterfall is the Goddess of all waterfall in Bangladesh. It is one of the widest waterfall of Bangladesh. During the rainy season the flow of Jadipai fall becomes robust. The water of this fall is so cool and transparent. Though the path of this area is not smooth but when you will reach there you will feel the full tranquility.